Day dive boats are an exciting day best suited to people who are confident in the water. This is an active day, ideal for certified scuba divers and introductory divers, visiting an array of amazing Great Barrier Reef sites over 5 hours. Choose from the Silver Series’ ultra-modern sister ships, Silverswift and Silversonic, and Poseidon for the thrill of diving and adventure snorkelling. 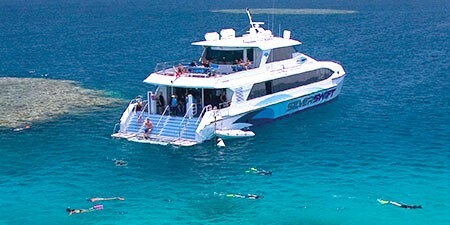 Departing from Cairns Silverswift is ready to whisk you away for a day of fun and adventure on the Great Barrier Reef. This is an active day all about being in the water for your dive or snorkel adventure of a lifetime! You'll explore spectacular coral formations and underwater gardens awash with vibrantly coloured marine creatures as you visit three different outer reef sites at Flynn, Pellowe, Milln and/or Thetford Reefs. Departing daily from Port Douglas. When you step aboard the ultramodern Silversonic you are set for an exhilarating day of fun, discovery and adventure in the natural wonderland of the Great Barrier Reef. With access to explore three stunning and exclusive reef sites at the renowned Agincourt ribbon reefs,each chosen for visual and ecological diversity for your dive and snorkel adventures. Designed for personalized dive and snorkel adventures; Poseidon Outer Reef Cruises departs daily from Port Douglas to take you on a journey of Discovery. You'll visit 3 different and spectacular sites at the Agincourt ribbon reefs. With clear outer reef waters, beautiful corals and incredible marine life discovery, the Agincourt ribbon reefs offer the opportunity to snorkel or dive in some of the most spectacular places on the entire Great Barrier Reef. Quicksilver and Great Adventures both operate day trips to pontoons. 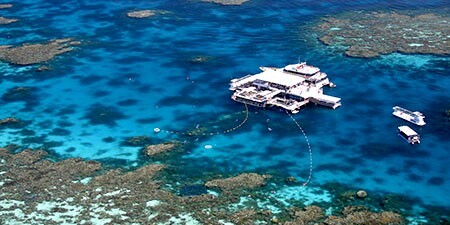 These pontoons are multi-level reef activity platforms moored permanently at the Outer Great Barrier Reef in exclusive, pristine locations. 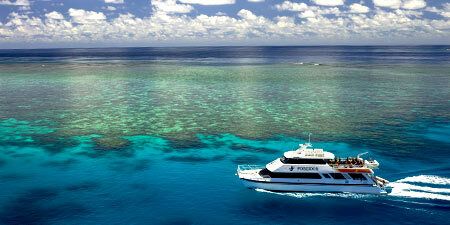 They provide a spacious, stable base to enjoy a wide range of reef activities in all weather conditions. Guests get to enjoy the facilities of the (air-conditioned) vessel and platform which includes undercover seating, change rooms and freshwater showers, underwater observatory, semi-submersible, snorkelling platforms, specially designed introductory dive areas and sundecks. The pontoon (activity platform) provides the widest range of experiences in which to see the reef making it a great option for experienced certified divers travelling with family or non-diving companions. While the family are cruising in the semi-submersible or snorkelling (or trying an intro dive!) you can enjoy up to 2 certified dives. 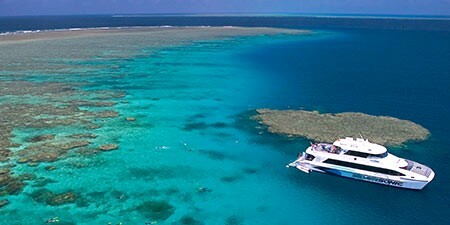 Scuba diving at the edge of Australia’s continental shelf is simply spectacular. Departing from Cairns, Great Adventures takes you to a spacious multi-level reef activity platform (pontoon) situated on the outer edge of the Great Barrier Reef. With a wide range of activities, the pontoon provides a great option for experienced divers traveling with non-diving companions. Certified divers can dive directly off the platform to explore selected sites like Turtle Sanctuary, First Bommie and Secret Gardens with depths to about 16m. 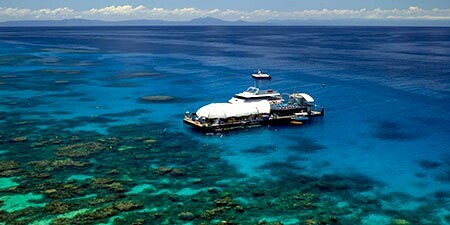 The islands of the Great Barrier Reef, with their pristine coral gardens, offer a vibrant variety of marine life for the scuba diver to discover. Michaelmas Cay provides an ideal locations for introductory divers with Ocean Spirit conducting diving from the cay’s shallow waters . Both certified and introductory divers are catered for at Green Island with a range of offshore dive sites reached by dive tender. 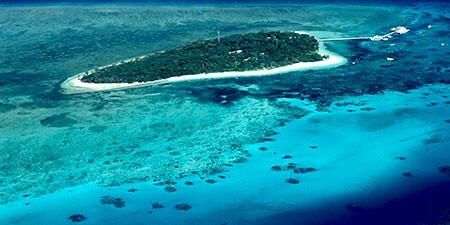 Green Island is a popular day visitor island on the Great Barrier Reef, just 45 minutes from Cairns by fast catamaran with Great Adventures. This beautiful 6000 year old coral cay boasts a unique reef and rainforest environment, and a host of activities in which to experience the reef. Green Island provides an ideal environment for first time divers to experience scuba and the underwater world. 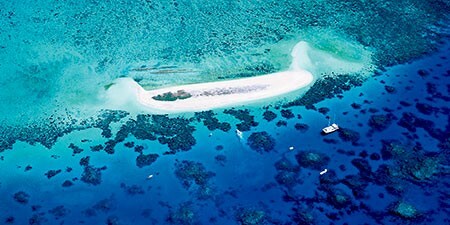 Set sail from Cairns aboard a 32 metre luxury sailing catamaran, Ocean Spirit, to Michaelmas Cay for a day to remember with a wide range of activities to fully experience this unique reef environment. The shallow waters off Michaelmas Cay offer a perfect environment for first time divers. No experience is necessary and you’ll have a highly skilled dive instructor by your side.